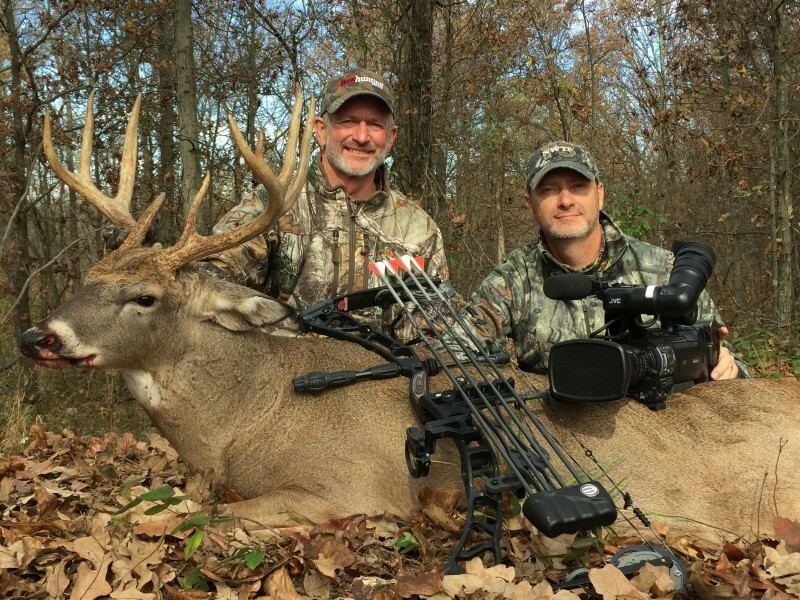 On November 6 in southeastern Illinois, despite daytime high temperatures in the low 70s and nights that never fell below 50, my friend John Brown and I managed to shoot a dandy 9-point buck on camera for a 2016 episode of the National Wild Turkey Federation’s NWTF 365 TV show. The hunt reinforced some old truths about hunting the rut. Above all else, I was reminded that bowhunting is a humbling game. After decades of doing this, it’s sometimes difficult to think you don’t have all the answers. And yet, every time I tune a bow, shoot some practice arrows, or head afield, I am reminded that only a fool thinks they know it all. On this brief trip I was reminded that despite all the research and all the data available to us, whitetail behavior remains largely unpredictable — especially during the rut — and that the best way to counter that is to keep your game plan simple. Always watch the wind and minimize your scent profile. Remember that funnels and preferred food sources are your best friend. Minimize human pressure, and never hunt your best spots until conditions are perfect. Be patient. When — not if, but when — things go south, keep a positive attitude, regroup, and get back after it. Continually tweak your bow-and-arrow set-up until it is tuned perfectly with broadheads. Be safe and do everything in your power to make sure you return to your family at the end of the day. We were reminded that no matter the weather, the does are going to come into estrus, and when they do the bucks will be chasing. This is also a time to be a bit more aggressive than usual, a time when calling and the use of attractant scents can play a big role. For example, on November 6 we used a combination of a grunt tube and a Primos "The Can" estrus bleat call to bring not one, but two, mature bucks that would gross score well over 140 from 200 yards across a cut bean field right to our tree. Had we not called to them, these bucks no doubt would have stayed out of reach, hanging with the gaggle of a dozen does across the way. Perhaps most important of all, every time I take a life I am reminded vividly of how fragile all life is, how quickly and unexpectedly it can end. Once an hour of your life has passed, it’s gone forever. These days, though extremely serious about hunting, I make it a point of smelling the roses along the way. I revel in the sunrises and sunsets, the sound of the wind in the leaves, the smell of freshly-turned earth. I give thanks every day that I am blessed to have been born in America, where we are men born free to make our own choices in life and can enjoy a hunting heritage passed down from those who had the vision so conserve wildlife and habitat for future generations. Be safe out there and have fun! And be sure to send me pictures of your success stories at bob.robb@grandviewoutdoors.com.